Iceland’s black metal scene is one full of creativity and unique sounds and Sinmara are but one part in a much larger group of musicians who make music so unlike other current black metal that the small country is now home to some of the most interesting projects around. While the Icelandic sound is different to most modern black metal it’s still difficult to pinpoint exactly what it is that makes it so intriguing. Is it the vast, desolate landscapes of their home country? The pitch black darkness or blinding sun of the most extreme times of the year? The remoteness of their locale giving rise to untainted ideas and themes? It could be all of those things or none of those things but Sinmara are one of the trailblazers of a scene that is so revered that it became one of Roadburn Festival’s commissioned projects at the 2018 edition (although Sinmara members were not a part of this performance, many of their contemporaries were). 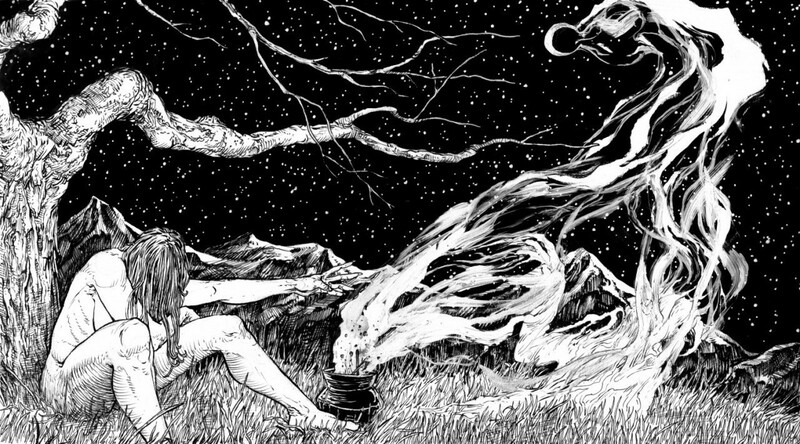 Sinmara’s second full length builds on 2014s Aphotic Womb and 2017s EP Within The Weaves of Infinity plays a large part in informing the melodic structures of this new record – Sinmara do not shy away from creating moments of great beauty within their chaos and many songs are deceptively harmonious at times. The dissonance of “Mephitic Haze” is tempered by Ólafur Guðjónsson rasping vocals and guitars that suddenly soar on high, rich notes that create passages of utter elegance. Last month found The Round Up Tapes exploring Barshasketh’s newest record, Barshasketh, and further to that study a conversation with Krigeist and GM was had. Below are the results of that conversation which was conducted via email. For those not familiar, what is the history of Barshasketh? How did the band come together and how has the geographical distance that now exists affected the way the band works? Barshasketh started off as Krigeist’s solo project over a decade ago. After he relocated to Edinburgh in 2010, he set about piecing together a lineup from local musicians, initially strictly for the purpose of playing live shows, but in time some of these live members were made permanent. Unfortunately, just as we were settling on a stable lineup, Krigeist ended up having to leave the UK in 2014 as his visa was revoked and BH, our drummer at the time, ended up leaving the band due to some rather unfortunate family issues. Undeterred by these logistical challenges, we continued to work on our music remotely and replaced BH with MK. We simply fly in members and plays shows with very minimal or non-existent preparation- as crazy as this arrangement seems, it actually works surprisingly well thanks to the discipline and dedication of each of our members in preparing the material individually. As it stands we’re spread across three different countries, and no two members are even based in the same city. Although it’s not always easy to do what we do, as long as we feel we’ve got something to say as a band, we’ll find a way of making things work.